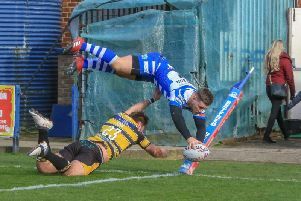 Halifax produced a clinical second half performance to seal a 60-18 Championship win over Whitehaven at the Shay. Richard Marshall’s side only led 18-12 at the break, having frittered away a 16-0 advantage. But a Dane Manning touchdown less than two minutes after the restart, the back rower pouncing on an awful error from Whitehaven full back Richard Lepori, was converted by Scott Murrell for a nerve-calming 24-12 scoreline. A James Saltonstall try quickly followed, paving the way for further touchdowns from Ben Johnston and Steve Tyrer, all converted by Murrell, as the scoreline ballooned to 42-12 after 55 minutes. Haven gained some respite with a Scott McAvoy try, but Murrell, Adam Robinson and Ed Barber rounded out a comfortable win, Murrell finishing with nine conversions and Tyrer one. The home side came out of the blocks quickly, with winger Tommy Saxton touching down in the corner after a minute following some slick passing from Danny Craven, Johnston and Tyrer. Tyrer missed the conversion, but was on target four minutes later when he scored himself on the left flank. Leading 10-0, Fax then stretched their advantage to 16-0 after loose forward Adam Robinson raced on to a Saltonstall grubber kick. At that stage, it looked like a slaughter was on the cards, but Halifax slowly lost the intensity they had in their game early on, allowing the Cumbrians back into the contest. Half back Deon Aiye scored from a Jordan Johnstone kick, Johnstone converting, before a fine finish from the veteran winger Craig Calvert, again goaled by Johnstone, made it 16-12 after 30 minutes. Halifax stepped up a gear, going close to scoring through Ben Heaton before a penalty from Murrell on the stroke of half time gave them an 18-12 advantage.